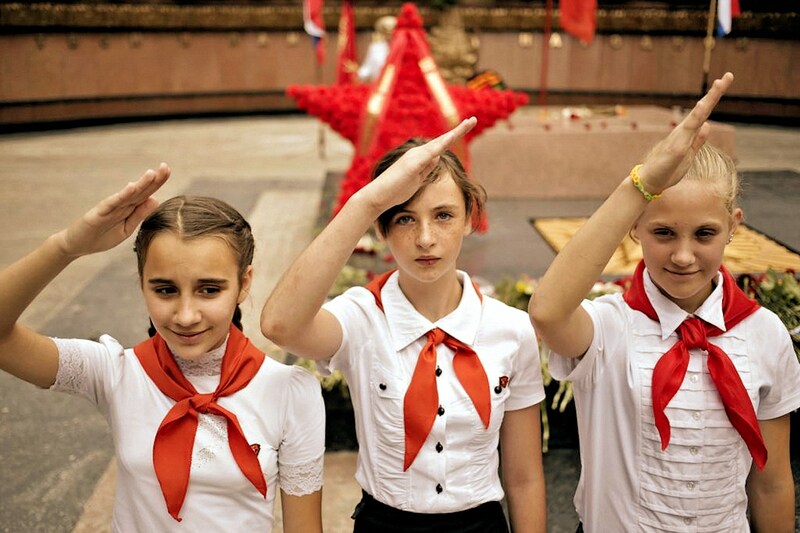 These young girls in Simferopol, the capital of the Republic of the Crimea (a federal subject of the Russian Federation), are contemporary Young Pioneers. The Pioneer organisation still exists under KPRF auspices. In fact, the people in the Crimea and the notional “Ukraine” (both in the Peoples Republics and in the junta-misruled American client state) are more “Soviet” than most other post-Soviet people are. Communists are prominent in the patriot resistance against the Galician Uniate nationalist filth. In fact, after the war is over, the region is ready for a communist revival. Not only that, but the Russian Federation becomes more “Soviet” with each passing month. Russians no longer care about pleasing arrogant Anglo American brats. I’d say that some of the reasons why Russians have come to hate Anglo Americans are pushy Anglo businessmen, arrogant Anglo “missionaries” (even most Russian Prods can’t stand ’em), and condescending Anglo officials. Russia, of course, is a country with a FAR longer history and FAR deeper culture than the Anglo juveniles have. The USA did NOT “win” the Cold War… the USSR committed suicide under Gorbachyov. Russia wants to embrace ALL of the good in its long history… Kievan Rus.. Old Russia… Imperial Russia… the USSR… the coming Eurasian Union. Traitors like Potapov are contemptuous servants of the Anglo Moloch. However, even though he went grey in the dog’s service, don’t hate him… he’s a know quantity, and most real people despise him for his duplicity (as one priest told me, “I can deal with Lebedeff, he’ll admit that he’s wrong… Potapov is never wrong”). Look at this photo. You can stand with healthy decent people like the communists or you can stand with those who’ve allied themselves with the worst elements of capitalist theft.. you can stand with communists or you can stand with the greedy Anti-Life Republicans. I stand with the communists. After all, “Christ was the first communist”, as G A Zyuganov put it. I stand with the Young Pioneers in Simferopol. I stand with the communist fighters in Novorossiya. I stand with communists wherever they may be… in an imperfect world, they’ve stood for more right than wrong (all earthly systems are mixed, sadly enough).